Edasalonexent inhibits NF-κB, an important mechanism in DMD because NF-κB regulation plays a key role in skeletal muscle health and activated NF-κB is seen in boys affected with DMD prior to the clinical manifestations of their disease. In the placebo-controlled Phase 2 and open-label extension of the MoveDMD trial investigating the safety and efficacy of edasalonexent in boys enrolled at ages 4 to 7 affected with DMD (any confirmed mutation), edasalonexent preserved muscle function and substantially slowed DMD disease progression through 60 weeks of treatment compared to an off-treatment control. Consistent improvements in all assessments of muscle function were observed after more than a year of oral 100 mg/kg/day edasalonexent treatment compared to the rates of change in the pre-specified control period for boys prior to receiving edasalonexent treatment. Additionally, supportive changes in non-effort based measures of muscle health were seen, with significant longer-term reductions in muscle enzymes and C-reactive protein (CRP), supporting the durability of edasalonexent treatment effects. Edasalonexent has been well tolerated with no safety signals observed in the trial. 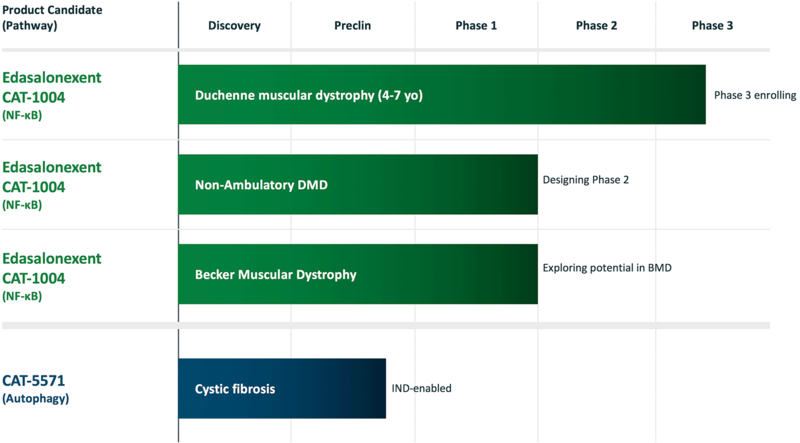 The Phase 3 PolarisDMD clinical trial has been initiated and is underway. Top line results are expected in the second quarter of 2020.